It could be a headliner for a show but no its even better ;-). I finished one of my WiPs from Wednesday. 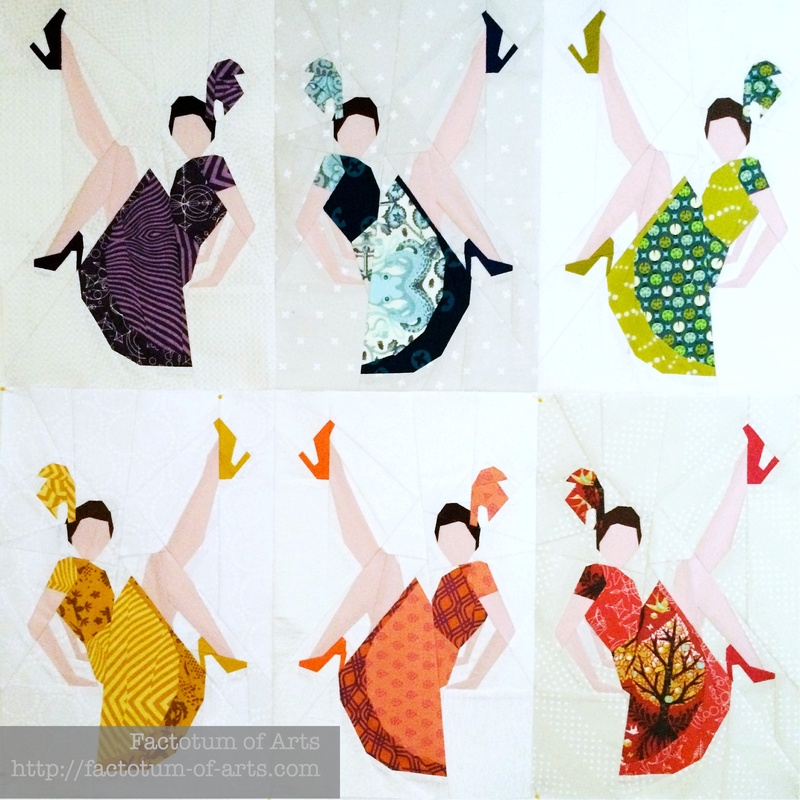 The Rainbow Can-Can girls, which is my contribution to Laura’s (@littleandlots) sisterhood of the traveling quilt. Here’s a close up of Miss Red…I love her shoes!! I think Miss Blue is my favorite as that catches your eye first but if you look a little longer then I also love Miss Green and Miss Orange. Best news though, I know Laura loves them already!! I hope that also excuses me (at least a little) for being 6 weeks late. Even more reason to celebrate the finish by linking up with Amanda Jean for Finish it up Friday. Skin: Kona Peony Hair: Kona Cappuccino, Kona Mocha and Kona Chocolate. This pattern has various sized blocks so you can also build a chorus line vanishing off in the distance. Obviously (as seen above), it also has a left and right facing girl for each size. Juliet is truly gifted in her pattern making and makes it so easy for the person making it. Great news, Juliet has also offered to provide one copy of her pattern as a giveaway. One full pattern of “A Chorus Line” Pattern by Juliet @ Tartankiwi + I will throw in some scraps of the fabric I used in my Rainbow chorus line – oh yes, some Tula Pink and Alison Glass. All you need to do is leave a comment letting me know what your favorite Paper Piecing Pattern is from Juliet’s store. If you follow me, you can leave a second comment. I will randomly choose a winner @ 10 pm Friday August 14th. UPDATE: The lucky winner of this pattern is #7 Catriona. I will email you shortly. This entry was posted in Uncategorized and tagged Finish it up Friday, giveaway, paper piecing, Sisterhood of the Traveling Quilts on August 8, 2015 by mlwilkie. 51. I follow you via email. 52. The Kea Alpine Parrot is my favorite. 53. I follow Factotum of Arts on Bloglovin. 54. What delightful blocks! Thanks so much for sharing your fun creations. Can Can girls is actually my favorite pattern by Juliet, but I also like her Ballerina pattern, and all those wonderful birds. 55. I follow you via Bloglovin. Thank again! 56. I follow you on Bloglovin’. 57. Looking at Juliet’s patterns, it is hard to pick a favorite. I adore the little Wren. 58. 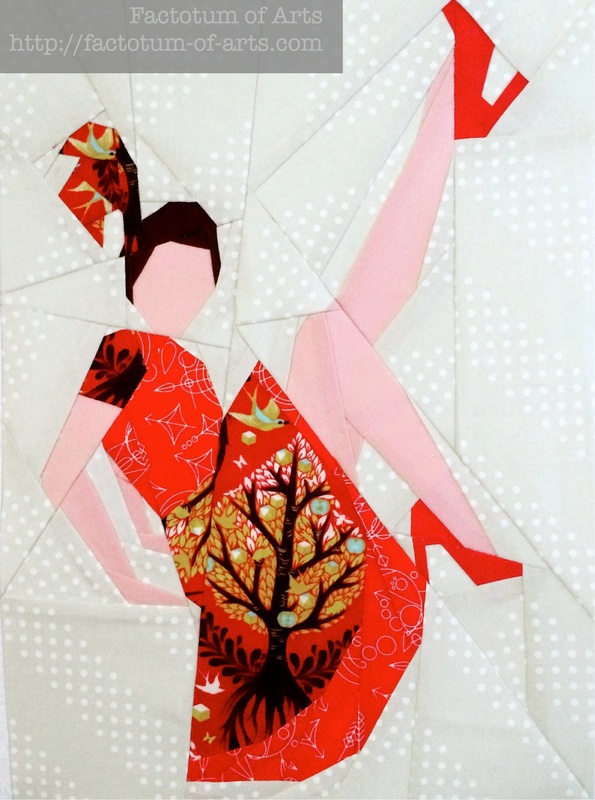 I like the Butterfly 12″ Paper Pieced Pattern! 60. What an interesting idea with the can can girls. 62. And I do follow you on your blog and on IG! Thanks again for the chance to win. 63. I love Big Bear.mi was in a round robin where it was the center and it was just lovely! 65. I follow your blog on WordPress! 66. I bought all the safari animal patterns, but I’m afraid I have yet to make any I do really love the bear set too.